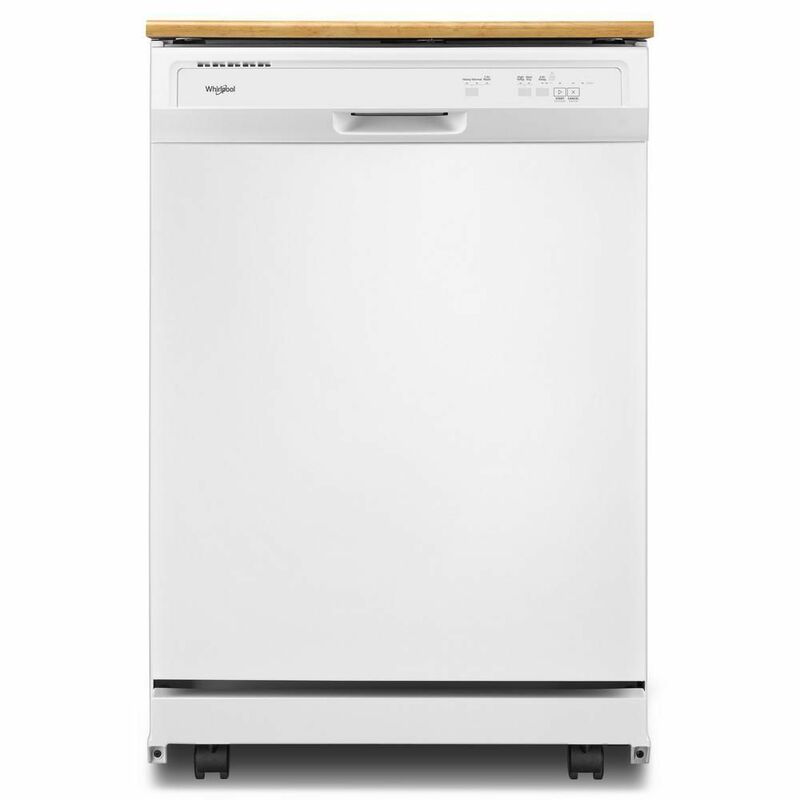 Front Control Portable Heavy-Duty Dishwasher in White, 64 dBA Get the right clean for your dishes with this heavy-duty dishwasher. Finish the job in half the time with the 1-hour wash cycle and rely on the soil sensor to adjust to the soil levels of your dishes for the most thorough clean. Count on this dishwasher, because no one has fewer repairs for over 20 years in a row. Portable Dishwasher in White with 12 Place Settings Capacity is rated 4.3 out of 5 by 363. Rated 5 out of 5 by Sue from Great dishwasher! ... Great dishwasher! Rated 5 out of 5 by Buythis from I love this dishwasher!!! Small kitchen, never had dishwasher. This dishwasher is awesome! Super easy to move and hook ups are simple! Holds a bunch! Been using for 6 weeks, saves so much time and water! Dishes come out so clean. I recommend this dishwasher. Rated 5 out of 5 by Erika from I love you, Whirlpool dishwasher When my last dishwasher (Maytag) expired I bought the Whirlpool portable dishwasher. My dishes have never been so clean! The Maytag never did such a good job as this one. Is there a way to hook up this dishwasher directly to the plumbing instead of having to drag it to the sink? Are these water intake and eject valves at any other place other than the top hose? No - it is a portable dishwasher specifically designed to be dragged over to the sink. It would not be cost-effective to change the water/drainage management on the machine or to modify your plumbing to accommodate the hose attachment (I don't even know how you would even begin to do either) It would be easier to take out a base cabinet and install a built-in unit. I want to use this dishwasher in a summer cottage. There is no heat in the building in the winter. Can this dishwasher be winterized? Thanks.